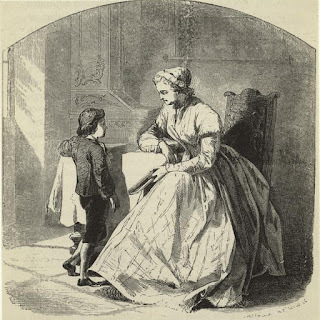 “I don’t want porridge, mother.” George scooted the bowl away. Liquid starch scalded him as it sloshed over. He wiped his reddened hand with a yellowed cloth from the table. “You can run into the henhouse and get an egg, then. Or break off a chunk of bread. There’s still a bit of cheese left in the cellar,” she said, grabbing some grapes to hand over. She set the grapes back down and raided the pantry. He knew he was right, he wasn’t a boy anymore, but if he wanted to be more, he had to go off and do something. He just had to make his mother understand. George beamed, proud of himself for his fast thinking. In all their times bringing up the Navy, he had not thought to come at it from that perspective. But why not? Of course he would dote on his mother, for all their disagreements, for all her sheltering—she was his mother. Still, if she said no, he didn’t think he could ever forgive her. When he saw her shaking her head, George had to dig his nails into his palms to keep the tears back. George knew he had lost. But he couldn’t think of anything else that would change his mother’s mind. He supposed he could just leave—grab his bags, head for the door and get on the carriage. Today was the last day the frigate was in port. Today was the last day he could start his own life away from this miserable place, away from his miserable mother. And George prepared himself for the worst. Then, it took another moment for him to register the tears trickling down his mother’s cheeks. But rather than filling him with elation, her words filled him with dread. I can go? The decision was his now. Can I go? And the question about what to do with his mother still had no answer. Somehow, in the back of his mind, he never really believed she would let him leave. Or was it that she knew I didn’t really want to go? “I suspect you’ll forget all about me the moment you get on board. But if that’s what you want,” she said. George couldn’t go. He absolutely could not. He stared for a long moment pouring through his thoughts over his porridge, considering what to say to mend their rift, to make things better, to get his mother to tell him she loved him. He could start by staying. George Washington kissed a bitter tear from his mother’s cheek, whispered thank you, grabbed the bags from the floor and headed out the door to join His Majesty’s Royal Navy. In 1746, George Washington’s half-brother, Lawrence, and his sponsor and friend, Lord Fairfax, secured a positon for him on a British frigate as a midshipman. His mother refused. But, what if the argument had gone differently and Washington had left to join the British Royal Navy? Picture at top features George Washington as a boy with his mother.